We continue with our temporally reversed coverage of the Hardly Strictly Personal 2017 Festival that took place at the Finnish Kaleva Hall in Berkeley in March. Today we look at day 2. The evening began with Oa, the voice-and-electronics duo featuring Matt Davignon and Hugh Behm-Steinberg. Next up was Skullcrusher, a solo project of Phillip Everett. Skullcrusher featured a variety of sonic implements, some processed and amplified, along with an Arturia Microbrute synthesizer. There were harsh noise elements throughout the set, but also snippets of melodic and harmonic material mixed in. Interestingly, the set elided into the next one featuring Joshua Allen on saxophone, with the two playing together in a frenetic improvisation before Skullcrusher faded out and Allen continued on his own as a solo set. There were several solo sets featuring wind instrumentalists on this evening. Joshua Allen was followed by Jaroba, who played an exceptionally inspired set with bass clarinet and percussion. Jaroba coaxed very subtle and intricate sounds from his instruments, but with dramatic moments as well. The dynamic range, phrasing and narrative structure made it very musical indeed. His sounds managed to remain punctuated even in the complex and bizarre acoustics of the Finnish Hall. The music also had a emotional and spiritual dimension to it, which added to the listening experience. It was a joy to hear, and we congratulated him after the set. Next up was Dire Wolves, featuring Sheila Bosco on drums, Brian Lucas on bass, Arjun Mendiratta on violin, and Kelly Ann Nelson on voice and electronics. There was also video projection along with the music, which mixes “space music”, folk, and other elements into an undulating flow of rhythms and harmonies. Dire Wolves was followed by Arrington de Dionyso on saxophones, part of his epic “This Saxophone Kills Fascists” tour. There is nothing subtle about the message, or the music. de Dionyso’s playing is loud, strong, frenetic, no-holds-barred. But he also had some soft moments that broke things up. While in large part a solo set, he also performed as a duo with drums, and a trio that included Rent Romus on saxophone. The final set of the evening brought Voi! Maa! to the stage. This group features event-organizer Mika Pontecorvo on flute, guitar, and laptop manipulating sounds from other members of the band, which included Kersti Abrams on winds, Mark Pino on drums, Eli Pontecorvo on bass, Adrienne Pontecorvo on cello, and Jaroba sitting in on bass clarinet. Thet music unfolded with Mika cuing the other members of the group in various configurations, with loud hits, noise pads, but also some more subtle sounds, particular from Adrienne Pontecovero, Abrams and Jaroba. In the middle of the set, the music quieted down as Meg Pontecorvo read selections from her science-fiction writings. Overall it was a fitting close to the evening, especially as it brought the folks whose hard work made this event possible onto the stage. There is one more day to present in this backwards progression: Day 1. We will share that in a separate article soon. Last Tuesday I attended performance celebrating the 50th anniversary of KFJC radio at FLUX53 in Oakland. The evening opened with a trio of Arrington de Dionyso, Gino Robair, and Bob Marsh. The set began with the drone of an electric harmonium, the space was then filled with the chirping of Marsh’s performance on Alesis Airs, Robair’s percussive and chaotic Blippo Box sounds, and de Dionyso’s reed instruments. All the sounds, acoustic and electronic, had a similar quality, and seemed to come together in a pattern I would describe as “yodeling”. This was followed by a combination of low reed tones and bass synthesizer sounds, both of which had complex overtones again masking the separation between acoustic and electronic. During the next portion of the set, de Dionyso performed on a double-reed instrument that I am pretty sure was a nadaswaram, a South Indian instrument similar to the Indian shehnai, but larger. Surprisingly, it sounded more like a saxophone than what I would expect (based on my familiarity with the shehnai and double-reed instruments in general), and was set against bass synth tones and more “liquidy” sounds. The sounds evolved into a drone layered with scratches and bending notes, and then into something more evocative of old space or science-fiction music, with descending synthesizer timbres. From this mixture, a minor harmony eventually emerged. Robair then brought out his “signature cymbal”, and played bowed metallic resonances against gurgles and whispers. de Dionyso sang into various resonant objects as well, such as a partially filled metal water pitcher, and the detached bell of a bass clarinet. There was more of the “space harmonies” and drones, groans and static. And vocal syllables against machine-like sounds, softer percussive synthesizers and metallic resonances. The sounds faded out, leaving just the original harmonium droning. Then suddenly there were bells and loud “skronking” (fast-moving loud notes), and then the set was over. In the intermission, Walter Funk presented the Hologlyphic Funkalizer, an installation that uses a video synthesizer to interpret audio signals and project them onto an oscilloscope. I had actually seen a previous performance at the 2008 Edgetone Music Summit where Funk also played in the duo Kwisp. This time I was treated to a more detailed presentation and explanation of the technical details, including the Max/MSP programs that generated the audio signals and the analog video synthesizer. You can see visual examples at his website. The LARGE ensemble, which was indeed large, performed a series of conducted improvisations, with Gino Robair and Bob Marsh alternating as conductors. Marsh conducted the piece in dramatic fashion. It began slowly with atonal pitches, squeaks, bends and glissandi on various instruments. The woodwinds began to add more “pointed” notes, with some short runs and phrases. The full ensemble then came to a loud stop followed by silence; then back to more of the longer notes from the beginning, then another loud hit and silence. This repeated a few times. Out of last silence emerged guitar scratches and harmonics set against scraped percussion, eventually joined by plucked string basses with bending notes, then the smaller string instruments. The texture grew dense again with long notes followed by faster runs. The music became loud and energetic and “argumentative”. And then it stopped. The next piece, conducted by Robair, had a sparser texture that seemed to focus on individual timbres of the instruments and specific sounds. It started with analog synthesizers and noise generates (Travis Johns) set against fast gurgling trumpet (CJ Borosque). They were soon joined by string bass and guitar also playing faster tones, while the violins faded in with a long steady-state tone. I could envision the ensemble being played as if it was a synthesizer rig rather than a series of separate instruments and performs. The texture grew thick, with some deep bass electronic sounds set against the strings; then it grew sparse again, with drums, trombone and bass clarinet. After some jazz-like runs on the basses, the ending centered around loud multiphonics and overblown tones from the bass clarinet. The next piece started off like a standard from the 20th century classical repertoire, with detached pitches, atonal harmonies and percussive sounds. The music carried the tension and anxiety of a film score. Eventually the whole ensemble crept in. I also particular liked a section with clanging metal percussion against a very low synthesizer drone. Robair then introduced the next piece as “Stretched out Xenakis in G.” It very quickly lived up to its name, with very slow pizzicato glissandi, and drones set against percussion scrapes. It was interesting to watch some of the instructional cards being used in the conducting, some had very literal musical meanings like “louder”, “soft”, “sweet”, “fast”, but others had more unusual instructions like “subvert.” Eventually, the ensemble settled into a textural equilibrium with everyone playing at once, and then instrumentals were replaced by voices singing in such a way to keep the existing texture going. The voices and instruments moved towards subtle harmonies or unisons (which I realized were of course all on on near G). Against this harmonic structure I heard the scraping sounds from Tom Nunn’s skatch box. The texture of the music grew more complex, and was then suddenly replaced by a violin solo of a minor melody that sounded quite Eastern European. At this point, Marsh again took over conducting, and both he and Robair alternated every few minutes while the music continued uninterrupted. There were sections featuring mallet percussion, and squeaks on a soprano saxophone set against Nunn’s scratches, and a big “drum solo”. Later on, the mallet percussion rhythms took on a jazz feel in terms of syncopation and harmonies, an effect that was augmented by the presence of guitar chords. 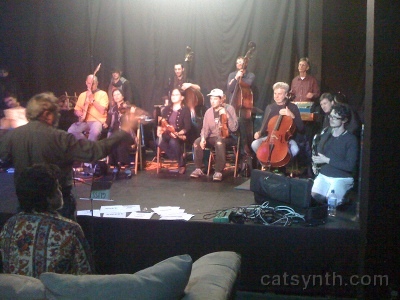 The texture eventually grew noisier again, with noise generators and loud, excited playing by the whole ensemble. The instrumental ensemble again became a chorus of voices, this time sounding a bit drunk. As the music grew software, Marsh held up the final instructional card: “God is in the details.” After this, the music came to a loud finish.